Another great lens with the same story as the Industar-50, this Jupiter-9 is an identical Soviet copy of the Carl Zeiss Sonnar. It is, by a large margin, the heaviest lens yet, which also makes it easier to focus than the both the Meyer-Optik and Industar, and I really appreciate the aperture lock, especially since the selector is again at the front of the lens. F-stop range is 16 through 2. The 1.6x crop sensor of the Rebel SL1 gives this normally 85mm lens an effective focal length of 136mm - my longest lens yet (though I did just order my first Canon "L" series professional lens, the 70-200mm zoom - deets to come). Like the Industar-50, this lens also came in black in later years, but the early serial number on this silver lens puts it as a 1965 model. I have no idea yet when I'll choose to pull out this lens over say, another, but 136mm at f/2 seems pretty sweet. 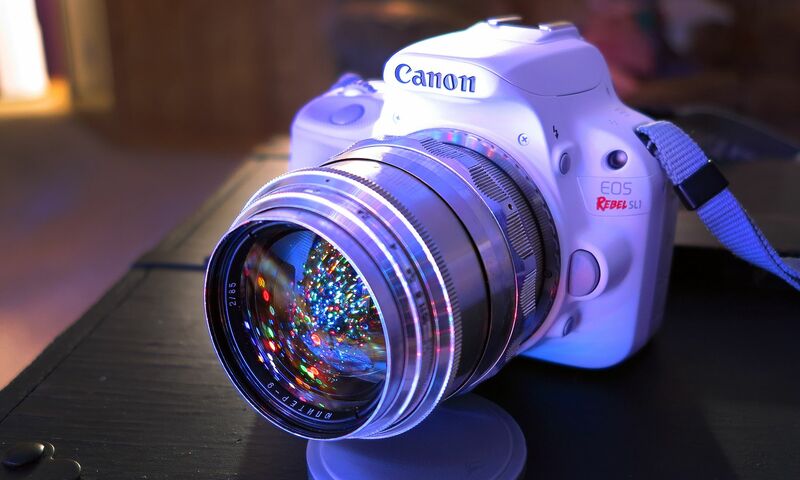 The 18-55mm "Kit" lens is 4.5 at the highest zoom and even the "L" series lens is an f/4.